Losing a tooth or even several teeth can be devastating. It can dramatically change your life and habits. Lacking a simple thing like a tooth can cause so much grief and extra attention and grief because It affects the way you eat, speak and smile. Without your teeth you can hardly function normally. This is primarily why dentures or false teeth were invented. In just a few days you can visit us for an affordable smile makeover holidays. Dentures basically serve as replacement parts to missing teeth. Most dentures however are flimsy and/or removable and can be quite uncomfortable at times. Part of difficulties of wearing dentures is the lack of good grip to allow them from not shifting in place during the wrong times. Keeping dentures secured in your mouth is a real challenge for dentists. Aside from that, you also have to deal with the slippage and occasional wobbling. Thankfully,our skilled cosmetic dentists are able to develop a fantastic and affordable procedure to solve this problem. The procedure is called dental stabilization system. 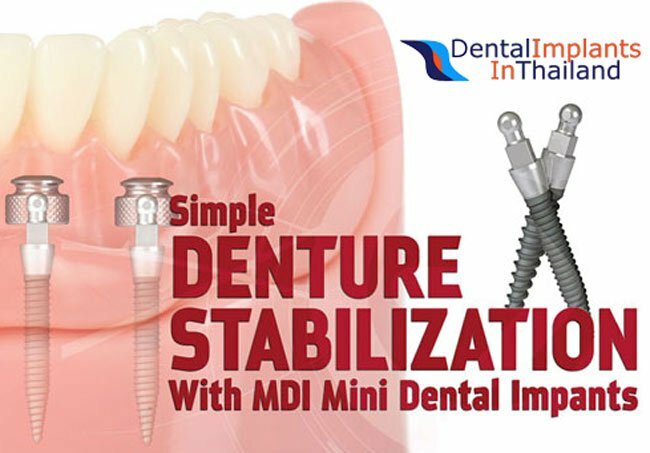 Denture stabilization involves the use of mini-titanium dental implants inserted into the gum area and into the jaw bone for a strong and permanent grip. During your first visit one of our dentists will take digital x-rays with custom measurements in your mouth to allow the doctors to drill the dental implants into your gums. The total number of tooth implants will depend on your needs and the types of dentures you prefer. Your custom dentures will be modified to fit your mouth exactly and a small metal housing will be attached to them. This is supposed to fit the metal head of the implants, and it will simply snap on together once the denture is worn to allow for a very comfortable and natural grip. Most people who use traditional dentures are unable to eat properly, or eat the foodstuff that they want because they are afraid that it would fall off or slip. Using temporary denture adhesives can also be frustrating because of its undesirable taste and limited effect. Dentures can be hard to deal with and everyday problems relating to its use could arise anytime. Denture stabilization is one of the solutions to these problems. Our expert dentists offer wonderful benefits that no denture adhesive could ever achieve. A denture stabilizer system can hold your denture in place for as long as you want, unlike denture adhesives that hold dentures in place for only a short period of time. It can also help keep ones gums and mouth healthier. Most important, it can help increase your self esteem. You can smile and converse with confidence because you are assured that your dentures are secured in a short dental vacation. The actual procedure is not painful and it takes only about an hour or two to complete. A local anesthetic is used during the procedure to block pain. After the placement of implants, it is natural to feel a little discomfort but it will eventually go away within a few days, as it fully heals. Eating too much sticky and hard food should also be avoided for a few days, as per recommended by your dentist. We typically recommend a 3-6 day dental makeover holiday depending on the total amount of work needed. Proper oral hygiene is important for people who choose to have dental crowns, bridges or dental implants. It is also important to check and clean your dentures regularly for food remains before you use it. Following our dentists post-implant recommendations for proper oral hygiene will help prevent any infections and keep your mouth healthy and clean. With a denture stabilizer, eating, chewing, speaking, smiling and mingling with other people is like having your complete set of teeth again. With enhanced confidence and self esteem you can do your daily activities with ease and satisfaction. To learn more about having denture retention surgery or Implant supported dentures in Thailand or if you are interested about our other high-quality yet affordable plastic surgery, medical & dental treatments we offer please contact us today.